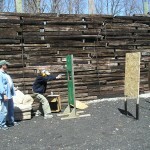 The International Defensive Pistol Association (IDPA) is the governing body of a shooting sport that simulates self-defence scenarios and real life encounters. It was founded in 1996 as a response to the desires of shooters worldwide. The organization now boasts membership of more than 20,000, including members in 50 foreign countries. RRGC has been a member club since June 1, 2009. Clicking on the IDPA logo will open a new window direct to their website. 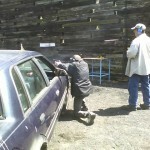 One of the unique facets of this sport is that it is geared toward the new or average shooter, yet is fun, challenging and rewarding for the experienced shooter. The founders developed the sport so that practical gear and practical guns may be used competitively. An interested person can spend a minimal amount on equipment and still be competitive. 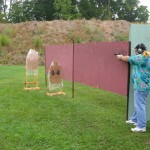 Anyone with a suitable handgun, holster, double magazine pouch and three magazines is fully geared up. RRGC typically hosts 6 matches a year which are open to all. 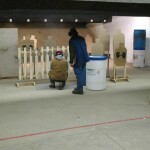 Costs are held to a minimum, usually $20 and for that you get a 7 or 8 stage, indoor and outdoor match of around 90 – 120 rounds. Download the Essex-Kent-Lambton Shooting Schedule below for a listing of 2016 matches in this area.